This strange, avant-garde house is not that easy to find, though few minutes on foot from the world famous Old Arbat street. It was erected in 1927-1929 by Russian Architect Константин Степанович Мельников (Constantin Stepanovich Melnikov, 1890-1974). Constantin Melnikov, архитектор (architect) and художник (painter) is considered a major architect of the end of the avant-garde architecture period. He was one of the rare independent artist of that time, following different movements, but always refusing to be fully part of any of them. In the 1930s, refusing to follow the emergent Stalinist movement, he was forced to retire from the architectural branch and worked as a portraitist and art teacher until his death. The Melnikov house is probably the best specimen of the architect's work. The three-story house consists of two intersecting cylindrical tower, decorated with a pattern of hexagonal windows. Melikov knew that despite he had the money to pay for it, his chances to obtain the 790 square meters land he was dreaming of to built the house of his dream were close to zero. 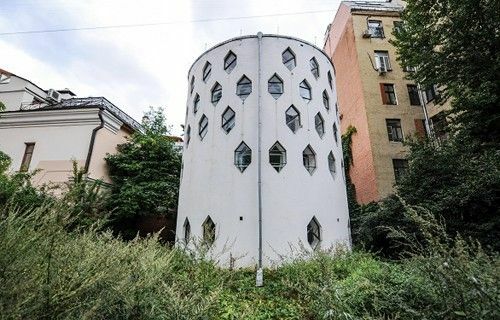 But to his surprise, he received the support of a working class commissioner, saying that "we can build public buildings anytime and anywhere, but we may never see this unusual house completed if we reject Melnikov". The city endorsed Melnikov's draft as an experimental, one-of-a-kind project. Melkinov's challenge was to build a residence spacious enough to house his family and his workshop. Like many artists, Melnikov was obsessed with natural light. His 50 square meters work shop has 38 hexagonal windows, while the living room is lit with a large single wide window above the main entrance. Material being scares at the time, Melnikov was limited to the use of bricks and wood and those in small quantity. Melnikov offered this cheap system of nested cylinders with a honeycomb structure for apartment buildings, but it never happened. Melnikov lived in this house until his death, and his descendants still live it. Согласно последней воле сына архитектора, дом должен был быть передан государству при условии, что станет музеем отца (according to the last will of the son of the architect, the house was to be handed over to the state to become a museum). Unfortunately, the legal status of the will was contested by the heirs and the museum has never been created. The house was entirely restored in 1998, thanks to the perseverance of the architect's descendants.